CHICAGO — For Democrats to take control of the U.S. Senate, they have to pick up four to five seats in November, and a must-win for the party is here in Illinois. 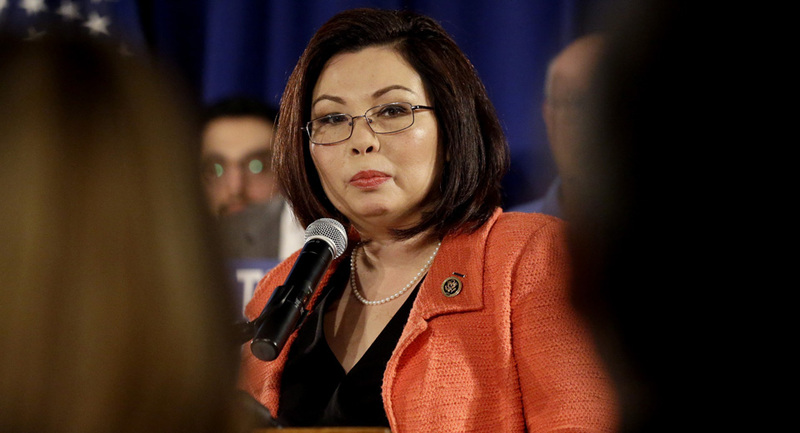 Democratic Congresswoman Tammy Duckworth from the Chicago suburb of Hoffman Estates is challenging incumbent Republican Sen. Mark Kirk, who won the open Senate seat in 2010 amid the anti-Obama Tea Party upsurge and the corruption trial of former Gov. Rod Blagojevich. Kirk, who had successfully portrayed himself as a moderate Republican in order to capture the seat once held by President Barack Obama, lags behind Duckworth in the polls. Nate Silver, editor of FiveThirtyEight and a leading elections prognosticator, had Duckworth with a 91 percent chance of winning as of Oct. 26, leading her opponent by 10 points, 53 percent-43 percent. This state that has gone blue in many previous presidential elections and heavily favors Hillary Clinton (who hails from Park Ridge, Ill.) still struggles with Republican far right influence mainly emanating from the governor’s mansion, which is occupied by billionaire Bruce Rauner. Rauner and his friends in the finance industry have poured cash into Kirk’s campaign, often avoiding federal rules on individual contributions. They do this by bundling the mega-donations into super-PACs and dispensing it through moderate sounding entities like Independent Voice for Illinois, which has spent more than $1 million in negative attack ads on Duckworth. 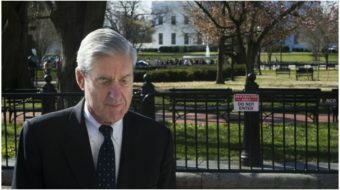 Republicans have all but given up on the White House but have doubled down on their efforts to win downballot races and maintain dominance in the Senate and the House of Representatives. GOPers say that by keeping Congress in the hands of Republicans, they will act as a check on likely presidential winner Hillary Clinton. House Speaker Paul Ryan recently issued a warning that if the Democrats take over the Senate, socialist Bernie Sanders would become chair of the Budget Committee. Ryan’s alarm may have had the opposite effect from what he wanted as numerous memes and tweets with hashtags like #BernTheSenate proliferated throughout social networks. 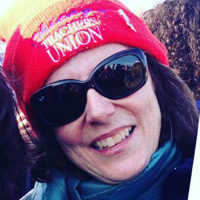 At an Oct. 18 roundtable on higher education with Duckworth held at the University Professionals of Illinois headquarters, AFT President Randi Weingarten said that electing Duckworth and putting Democrats in the majority in the Senate would break through the Republican obstructionism that has gridlocked Washington. Weingarten referred to a recent statement by Arizona Republican Sen. John McCain. 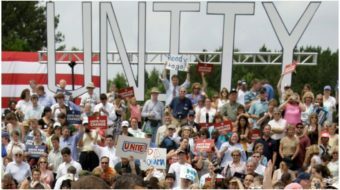 He said, “I promise you that we will be united against any Supreme Court nominee that Hillary Clinton, if she were president, would put up.” In other words, Weingarten said, we can expect more of the same. The Republicans have refused to hold a hearing on President Obama’s nominee to the Supreme Court, Merrick Garland, who would replace the deceased arch conservative Antonin Scalia. Weingarten said in order to get things done and improve the lives of the people, Clinton needs the Senate to be a partner. And the teachers’ union president says Duckworth would be a strong advocate for public education, both K-12 and higher ed. Weingarten facilitated the roundtable with university faculty and students from public universities and colleges, including Northeastern Illinois University, Western Illinois University and University of Illinois. Duckworth spoke about her vision for education, bills she has sponsored and her opponent’s voting record and controversial statements. She also took questions from the students and local media. Duckworth, who served in the U.S. military and lost both legs when her helicopter was shot down in Iraq, compared spending on military weapon systems versus education. “We are right now building a fighter jet called F-55 Fighter Jet. It is 10 years over schedule, and over 100 percent over budget. It was supposed to cost $200 billion. It’s now at 400 billion dollars and counting,” she said. Duckworth said that she wants to make sure troops have the best equipment but education needs to be seen as part of the foundation of national strength and as a global leader and democracy. Unfortunately, Duckworth said, the legislation that she has sponsored for debt-free and low cost college has been derogatorily called “entitlements” by her opponent. She said her plan for free community college would be paid for by closing corporate bonus tax loopholes, where CEOs get millions of dollars in bonuses but the business skirts paying taxes on it. The Tribune, a Republican-oriented newspaper that recently made national news by endorsing Libertarian Gary Johnson for president, also surprised many with its endorsement of Duckworth for Senate. Duckworth has also said that Kirk’s statements about the president, calling him a “drug dealer in chief” and about Sen. Lindsey Graham, R-S.C., calling him a “bro’ with no ho” show that Kirk is ideologically in the same basket as his party’s nominee, Donald Trump.